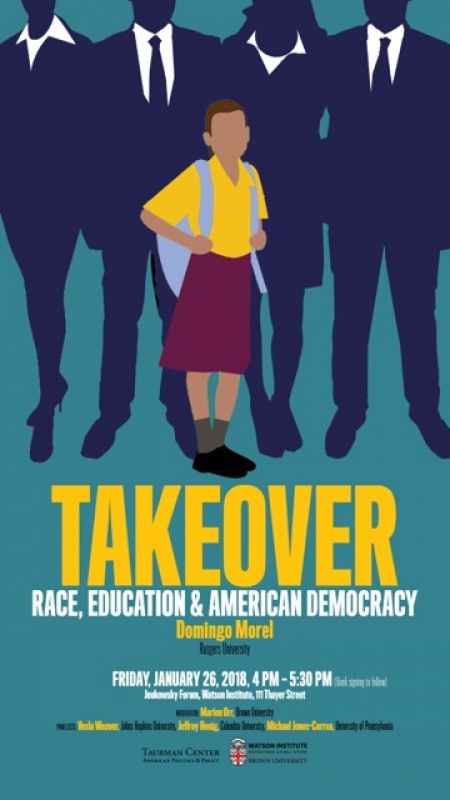 Domingo Morel PhD ’14, assistant professor of political science, Rutgers University, will discuss his forthcoming book, Takeover: Race, Education, and American Democracy (Oxford University Press). The book offers the first systematic study of state takeovers of local governments and their political causes and consequences. Morel lays out the conditions under which the policy will disempower or empower racial and ethnic minority populations, and expands our understanding of urban politics. Morel argues that state interventions are a part of the new normal for cities and offers a novel theoretical framework for understanding the presence of the state in America’s urban areas. The book is built around an original study of nearly 1000 school districts, including every school district that has been taken over by their respective state, and a powerful case study of Newark, New Jersey.